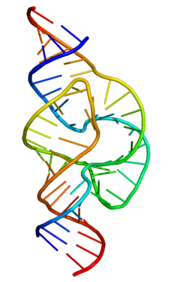 A ribozyme (ribonucleic acid enzyme) is an RNA molecule that can help certain biochemical reactions. similar to the action of protein enzymes. Also called catalytic RNA, ribozymes work in the ribosome to link amino acids during protein synthesis. They also take part in RNA splicing, viral replication, and transfer RNA biosynthesis. The 1981 discovery of ribozymes showed RNA can be both genetic material (like DNA) and a biological catalyst (like enzymes). This led to the RNA world hypothesis, in which RNA acts in the evolution of prebiotic self-replicating systems. Investigators studying the origin of life have produced ribozymes in the laboratory that can catalyze their own synthesis under certain conditions, such as an RNA polymerase ribozyme. Improved variants of the "Round-18" polymerase ribozyme have been developed. "B6.61" is able to add up to 20 nucleotides to a primer template in 24 hours, until it decomposes by cleavage of its phosphodiester bonds. The "tC19Z" ribozyme can add up to 95 nucleotides with great accuracy. Some ribozymes may play an important role as therapeutic agents, as enzymes which target defined RNA sequences for cleavage, as biosensors, and for applications in genomics and gene discovery. In 1967, Carl Woese, Francis Crick, and Leslie Orgel suggested that RNA could act as a catalyst. It was discovered that RNA can form complex secondary structures. The first ribozymes were discovered in the 1980s. In 1989, Thomas Cech and Sidney Altman won the Nobel Prize in Chemistry for their "discovery of catalytic properties of RNA". ↑ Johnston W.K. et al 2001. "RNA-catalyzed RNA polymerization: accurate and general RNA-templated primer extension". Science 292 (5520): 1319–1325. doi:10.1126/science.1060786. PMID 11358999. ↑ Zaher H.S. & Unrau P.J. 2007. "Selection of an improved RNA polymerase ribozyme with superior extension and fidelity". RNA 13 (7): 1017–1026. doi:10.1261/rna.548807. PMC 1894930. PMID 17586759. ↑ Wochner A. et al 2011. "Ribozyme-catalyzed transcription of an active ribozyme". Science 332 (6026): 209–212. doi:10.1126/science.1200752. PMID 21474753. ↑ Hean J. & Weinberg M.S. 2008. "The hammerhead ribozyme revisited: new biological insights for the development of therapeutic agents and for reverse genomics applications". In Morris KL. RNA and the regulation of gene expression: a hidden layer of complexity. Norfolk: Caister Academic Press. ISBN 1-904455-25-5. ↑ Woese, Carl 1967. The genetic code. New York: Harper and Row. ↑ The Nobel Prize in Chemistry 1989 was awarded to Thomas R. Cech and Sidney Altman "for their discovery of catalytic properties of RNA". This page was last changed on 5 September 2013, at 10:00.